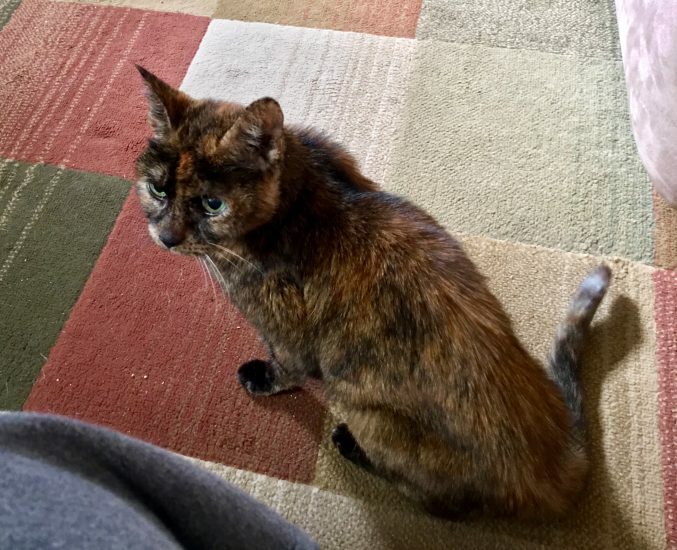 The family cat, Peanut Butter, is 17 years old and she may be dying. I waited to write about this because I was too upset to do it earlier, when I first admitted to myself that it was a possibility. I realize she’s old and that she’s had a good life, but I’m still sad thinking about losing her. If my cat is dying, our whole family will mourn her loss. She has been, until recently, sassy, stubborn and mischievous. We call her Miss Thang, Miss Bitchy Pants, Newman (think the annoying guy from Seinfeld) and Kitty Kat. The running joke in our house for years was that the cat and I didn’t get along. That I tolerated her because she belonged to my stepdaughters. In truth, I cuddle her when no one is around and refer to her by her various nicknames with affection. She has always been “Miss Thang” and “Newman” to me; I don’t give nicknames to people or animals I don’t care about. You can see the way Peanut Butter’s bones are sticking out in this picture from her visit to the veterinarian’s office last week. We’ve taken her to the veterinarian multiple times in the past several months. She’s developed high blood pressure, gone blind and been treated for a flea allergy. A year ago she weighed over ten pounds. Now she weights 6.2 pounds. She is skin and bones, despite eating well. She’s so thin you can feel every bump on her spine. Her hip bones are as sharp as blades. Her fur is rough and has lost its luster. She is frail, walks gingerly and occasionally sways on her feet as though too weak to walk. She seems to be shutting down somehow. It is painful to watch my cat dying. After a battery of tests, we are still waiting for answers to our latest concern – her drastic weight loss. It doesn’t appear to be cancer. It’s not a parasite. Blood work has been sent to the school of veterinary medicine at Michigan State. They are hoping to determine whether it is a rare form of thyroid disease. If it is, I can choose between treating her with medication or submitting her to radiation treatment. If Peanut Butter undergoes radiation treatment, she will be so radioactive she’ll have to be quarantined for five days. I can’t bear to think of her alone in a strange place, sick and scared. We don’t know how long it would prolong her life. Months? Weeks? Days? She is still adjusting to having gone blind less than a month ago. Our senior dog Soldier will be devastated if his cat is dying. They sleep together, curl up around each other, and antagonize each other daily. They are, in the best sense of the word, siblings. So I wait. And I worry about my cat dying. And I hope that I won’t have to make a decision I’ll second guess over and over. And I keep trying to make her comfortable and let her know we love her. And wish I could do more. End of life decisions are so difficult. I’m sorry to hear she is doing so poorly. I hope they are able to ease her symptoms after the test results. Oh my goodness. I am so sorry to hear about Peanut Butter and her condition. I’ve been through a similar situation. Sounds like thyroid. Maybe a get second opinion? First thing I would definitely recommend is document document document. Take video take pictures while she is still moving and active. You want to have memories. I wrote about my experience in this blog post. It may help you with making decisions. https://www.cpccares.com/blog/euthanasia-when-time-say-goodbye/ Maybe get a second opinion? I hope whatever medication they are able to give her gives her comfort. You’re in my thoughts. These situation s are never easy. Kamira, thank you so much for your support. The post about knowing when it’s time to say good-bye really resonated with me. I believe it will help me to make the right decision when the time comes. Aww Peanut Butter! I’m sorry she’s not feeling well. 17 is impressive! I lost my 10 year old rabbit back in August and was so heartbroken. 10 is pretty old for a rabbit, but still. Sometimes it feels easier when they are old because you know they’ve lived a full life but, at the same time, it’s hard to lose a friend you’ve known for so long. My rabbit’s been gone for two months now but after 10 years of caring for him daily it still feels weird not to have to care for him everyday. I hope you find out what’s wrong with Miss Thang and that she has more time left with you! Thank you, Michelle. I know you understand how it feels! My condolences on the loss of your rabbit. It will take some time to get used to not having him around. Kristen, your support is appreciated so much – I know you understand the difficulty of letting go of a cherished cat. Your photos of your current kitties are always uplifting. My heart goes out to you and Peanut Butter. The decision of what to do is always a difficult one. I have two cats, ages 15 and 13 and as they get older their health shows it. 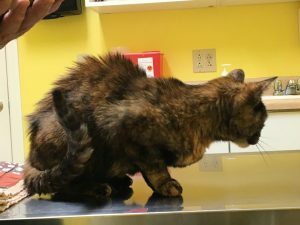 My oldest cat was showing “odd” signs and luckily after testing we found that she required thyroid medication and has since been feeling and doing much better. It’s never easy to watch them age and see their health deteriorate. Hugs to you both. Thank you, Kelly. It’s good to know that there might be a viable explanation that is treatable. We are still waiting to hear the results of her thyroid panel. My fingers are crossed! I’m so sorry to hear about Peanut Butter. There is nothing more painful than losing a pet. Quality of life is a big issue, surely. It may be a good idea to speak to a grief counselor. Some animal hospice or palliative care will come to your home and provide pain-relieving methods and counseling. Heather, this is something we’ve been looking into and I do think it may be time. I am so sorry to hear this. I don’t even know what i will do when Babu’s “time” comes. I am sending lots of good thoughts to you and Peanut butter. She led a good life and ultimately that is all we can do-give them lots of love till their last breath. Your post was lovely and heart breaking. How I wish I had some sage advice but I don’t. I just wish you peace and Peanut Butter a peaceful end, surrounded by love. Oh no, poor peanut butter! I am sure you will be feeling so sad when you lose this sweet member of your family. Our dog is so loved by all my kids, I cannot even consider this happening to us. It is so hard to lose a loved one. My heart goes out to you during this difficult time. I think radiation would be difficult for both of you. My mom’s cat had kidney failure and it was hard to watch her grow weaker, but she still had a fierce determination to live. Emma lasted longer than the vet thought she would, and she seemed to appreciate the days she had. She always hated the vets, but it seemed like she was starting to suffer, so my mom made an appointment with the vet. We were grateful that Emma passed away quietly about two hours before the appointment. I think about my pup dying way more than anybody should even though she is only a few years old, just the thought of her not being around makes me cry. I can only imagine what you’re going through, having to watch her in this condition. I hope that the tests are able to give you some answers and that she is able to continue to have a full happy life for even just a little bit longer. Sending our love! I’m so sorry to hear she isn’t doing well – these decisions are never easy. You know your babies better than anyone and I know you’ll make the right decision for you both. I am so sorry you are having to go through this. Having to think about these options is never hard and it never gets easier. Praying for Peanut Butter! I am so sorry and sending you a big hug. It is the hardest time in our lives when we have to make these decisions when our fur-kids get ill and lose in some ways the quality of their life. Stay strong and remember you are doing everything in your power to help her. I am very sorry you are going through such a stressful time with Peanut Butter. We lost our rescue cat Nala at 19.5 after a bout with kidney disease 2 years ago which somehow was a shock.We lost her dog 2 years before after 17 years. It was tough but I knew we had all done our best and the time was right. All the best with your own decisions. I am sure you will make the best ones for Peanut Butter. I’m so sorry to hear about Peanut Butter. I hope you can get the answers you need from the veterinarian and the tests. My thoughts are with you as you face some tough decisions. Thank you! Watching Truffle and Brulee is always such a treat – they are so beautiful and full of personality! I just get so darned sad and I wish I had some words of comfort. I have been through this and it is never easy. They are family members. Hugs to you. Thank you, Carol! You’ve been through a rough few weeks yourself, so I know you understand how hard it can be to watch your pet suffer. Your kindness is SO appreciated! Thanks! I’ll take all the healing vibes we can get!